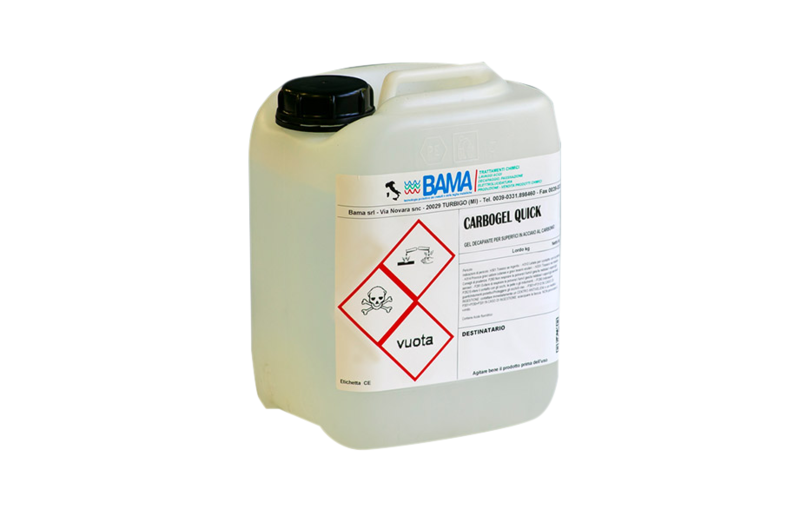 BAMA CARBOGEL QUICK is a high viscosity product with DECAPANING action on CARBON STEEL alloys (ferrous alloys). The gel removes oxides, salts and other residues from previous processes from the surface of the metal, eliminating the risk of localised corrosion. BAMA CARBOGEL QUICK is particularly effective at removing any trace of welding oxidation. BAMA CARBOGEL QUICK adheres instantly to the surface to be treated, without causing any dripping phenomenon. BAMA CARBOGEL QUICK must be shaken vigorously before each use. BAMA CARBOGEL QUICK does not eliminate any welding slag or lumps that can only be removed by mechanical action. After treatment, we recommend using the CARBOPASS product to passivate the surface. BAMA CARBOGEL QUICK can be applied to the surface to be treated by spray or brush. Spray application is suitable for large surfaces, while brush application is suitable for small or well-defined areas (e.g. welding). BAMA provides all the necessary equipment for a correct application of the product. for sale in 1kg, 3kg, 5kg buckets. When applying the product it is necessary to wear acid-resistant glasses, gloves and overalls and to protect the face from reaction gases with a gas mask fitted with a chlorine filter. BAMA CARBOGEL QUICK must be stored in a place protected from frost and direct sunlight.